How I've Been Getting My Skin Vacation Ready! When I’m on vacation, especially at the beach, I like to go for a much more natural look, and most of the time skip makeup all together. Who has time to put on a full face of makeup only to have it melt off in the sun or wash off and smudge the second you get in the water? I like to be able to throw on a little bit of mascara and a tinted moisturizer with SPF and call it a day! Because I like to keep my vacay makeup routine as fuss free as possible, I always try to be extremely intentional about skincare in the months leading up to my vacation in order keep my skin looking amazing, makeup or no makeup! While I do get the occasional break out here or there, the main thing I struggle with when it comes to my skin is clogged pores, especially around my nose. When I started going into full on “get vacation ready” mode with my skin care routine, the main thing that I was looking to add was something to help me detox and purify my pores, since that’s always been my biggest problem area! I also have combination skin, so while some areas get super dry, my forehead and nose area tend to be more on the oily side, and start to look pretty shiny after I’ve had my makeup on for a couple of hours. 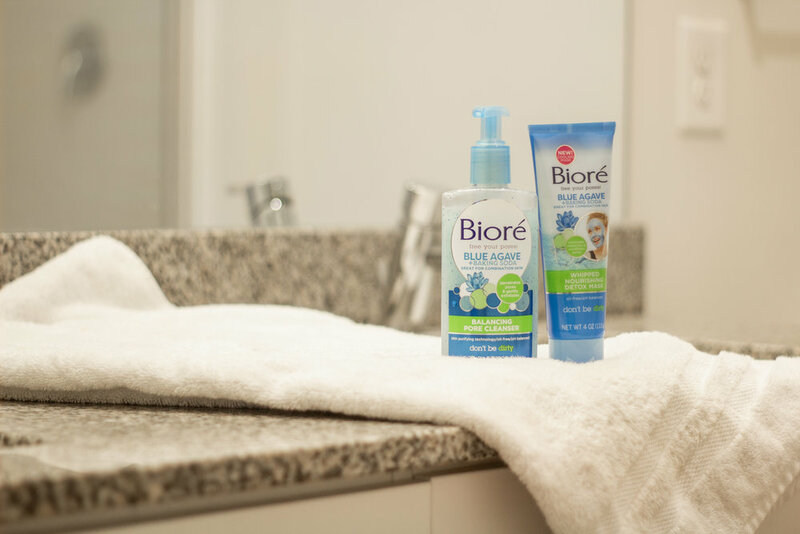 When I found Bioré’s Blue Agave + Baking Soda line, I knew it would be perfect! The Blue Agave provides conditioning benefits for the dry areas, while the baking soda is great for deep cleaning your pores, giving you targeted treatment for both areas and making this line the perfect solution for combination skin! The two products I picked up and have been using consistently are the Blue Agave and Baking Soda Balancing Pore Cleanser, which I have been using morning and night, and the Blue Agave and Baking Soda Whipped Nourishing Detox Mask, which I’ve been using 2-3 times a week! First off, the cleanser is amazing because it feels super energizing on your skin, so I love making it the first thing that I do each morning because it helps me wake up a bit! To use it, you wet your face and lather a pump of the product in your hands, and then massage it all over your face. The natural jojoba beads gently exfoliate, leaving your skin feeling smooth and refreshed. I like using this cleanser before makeup because my skin feels extra smooth, giving me the perfect base for flawless makeup, and I love using it again right before bed because the baking soda leaves my skin feeling extra clean! A few times a week, I’ve also been loving using the Bioré Blue Agave + Baking Soda Whipped Nourishing Detox Mask! On the nights that I use the mask, I first wash my face with the cleanser, but after rinsing off the cleanser I don’t dry it! Instead, I put a generous amount of the mask on my fingertips and massage it all over my wet face evenly, avoiding my eyes! The mask has a nice creamy texture, and it feels super tingly and refreshing when it’s on, which I think is from the baking soda lifting away dirt, oil, and pollution and why it’s so great for purifying clogged pores. This mask has quickly become something I look forward to because it helps me de-stress at the end of a long day! After about 3-5 minutes, I rinse it off and my face feels SO clean! One thing that I will say with this mask is that I would recommend only leaving it on for 3 minutes the first time you use it, just to gauge how your skin will react to it. If you have sensitive skin or react negatively to menthol, this mask may not be for you! I love the tingly minty feeling, but I do feel like if I had sensitive skin it might cause a negative reaction. Another piece of advice with this mask is that you want to be super careful not to leave it on any longer than the maximum 5 minutes! Having been using these two products for a couple of weeks now, I can definitely see a difference in my pores, and my skin feels clean without feeling excessively dry, as it often does when I use products that promise a deep clean! I definitely see myself continuing to use the Baking Soda + Blue Agave line even after I get back from my trip because I absolutely love the way it’s made my skin feel, and it has become one of my favorite parts of my morning and evening skincare routine! Draper James: The Perfect Choice For TN Steeplechase!